The first thing that struck me about this week’s puzzle was the size and shape of the grid… 192 squares of it, presumably representing a wall. What’s more, there were 31 squares which were completely barred off. The second thing I noticed was that the setter was Nemo. Well, he may not be a Nobody, but he certainly seemed to be a Newbie. A reading of the preamble disclosed that, while the Rows were entered normally from left to right, the answers to Path clues were entered snake-like from starting square to one of the squares with a dot in the top right corner. 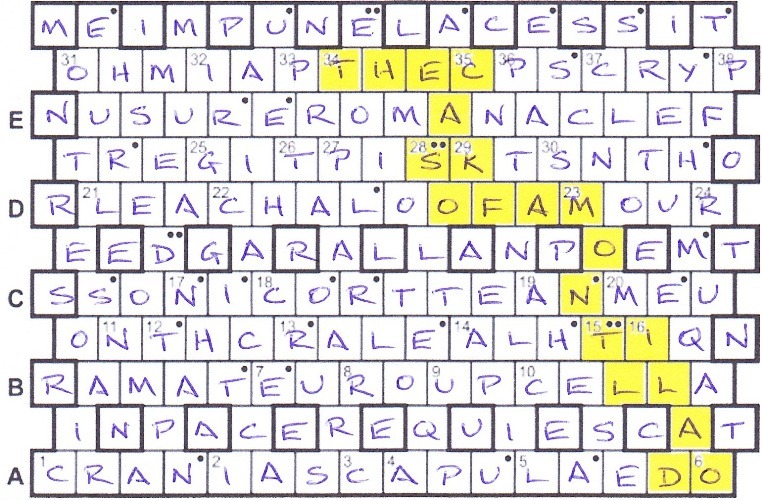 When all the answers had been entered, we would be able to trace out a title and fill in the 31 barred off squares. I just hoped that I’d be able to unravel it all. Of course, my first guess was that the wall was the one in Shakespeare’s play within a play: Pyramus and Thisbe from A Midsummer Night’s Dream. The last time that was used in a Listener was way back in 2003 with Obiter’s Hole in the Wall, so it was due another outing. The trouble this week was that there seemed to be 31 holes in the wall! Starting with the Row clues, I was gratified to find that, at first sight, they were relatively straightforward with the three Row A clues quickly solved. Sadly, at second sight, Rows B and C revealed only two each, Row D none, and Row E one. This was going to be one tough newbie! I started on the Path clues and finished my first pass through all of them in about an hour and a quarter with just over twenty solved. However, none of them could be entered with more than one or two letters. What was worse was that they weren’t helping much with my unsolved Row clues. After that, it was slow progress, but gradually letters were teased out and into the grid. At the end of four hours, split over two sessions, the grid was looking much healthier. There were still some gaps around the middle, with one or two clues being particularly recalcitrant. Even 2 Cooler? This croaker may end up there (4) which was (almost) obviously ICER took an age to work out its American ‘kill’ relevance. Also 13 Rattly breath of spirit with short time to go (4), which I had a (less than convinced) feeling was ROAR, ended up as RALE (MORALE – MO). With most of the right half of the diagram complete, I thought I’d have a go at identifying the title. Working back from square 6, ODALLI enabled me to suss AMONTILLADO which took me into the top half of the grid. There, THE in Row 2 (from the top) and OF in Row 5 led to my first guess The Mask of Amontillado, the follow-up to The Count of Monte Cristo. All in all, this one took over 4½ hours to get to this stage, but I still had some entries that didn’t quite fit into the grid. I therefore spent another 90 minutes with another copy, refilling the grid and tracing the entries to make sure that all the black dots were accounted for and finally being happy. On the clue front, my favourites were 10, with its reference to Hillary Clinton’s daughter CHELSEA, and 18 Songwriter said he’d handle stuff of mine (10) for COAL-PORTER! I have to say that my least favourite clue (and the one I solved last) was 33 Dad returned after imbibing one for Wally? (8) for PARIETAL (PA + LATER< containing I) — in my view, this required not only the question mark, but also some exclamations!!!!!! (yes, six would do it). As I transposed the grid from my working copy to the one for submission, I got to the middle line. Now, how do you spell Poe's first names? Well, that was close, it's ALLAN not ALLEN. I have to say that I, probably along with others, had a sneaky feeling that this was an existing setter masquerading under a different pseudonym. If not, this was an excellent debut. Not only was the theme beautifully devised, but the clues were on the tricky side of tricky. Thanks, Nemo, and I look forward to number two. And apologies for no animation this week — just the thought of it gave me a headache! This entry was posted on 19 May 2017 at 4:00 pm	and is filed under Solving Blogs. Tagged: Get Me Out Of Here!, Nemo. You can follow any responses to this entry through the RSS 2.0 feed. You can leave a response, or trackback from your own site.